ONIONS , WATER , VINEGAR , SALT , SPICES AND SODIUM METABISULFITE ( what ? ) 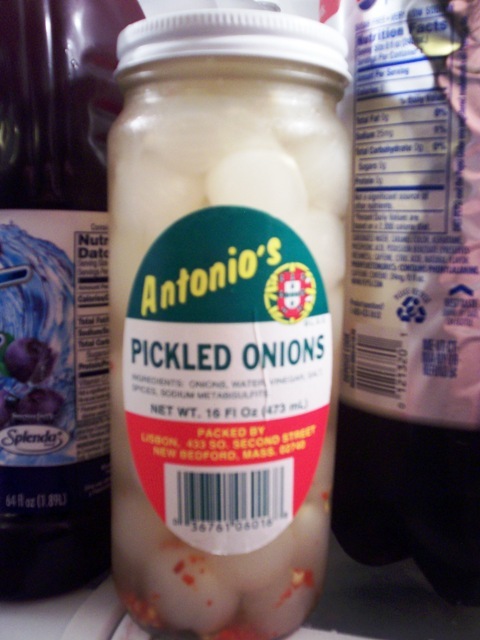 , those are the entire ingredients in a jar of ANTONIO'S PICKLED ONIONS . That's it , 6 ingredients . And that's always good . These things have been around in our area for ages . And we've been buying them for years . As a matter of fact BABY LAURA ( who's now almost 32 ) used to cry for them while stuck in her high-chair at the dinner table . You couldn't imagine the face of a 2 yr. old chomping down and licking a pickled onion . Hilarious , but I couldn't get it away from her . She LOVED them ! And she still does . I got a 16oz. jar at STOP&SHOP for only $ 1.99 on sale ( regularly $ 2.79 ) .Quite the bargain . Plus they're packed by LISBON in near-by New Bedford , Ma. VERDICT : I really don't know how to describe it. Mom's description is very accurate, however, nothing can prepare you for the taste. It's a very sharp bite and if you're not ready for it, you'll be in trouble. My face gets all red and sweaty when I'm eating these, and although the taste is terrific, you really can't eat a lot of them in one sitting (or at least I can't anymore). My mouth is actually watering right now because I'm remembering the intense flavor of the onions. Think salt and vinegar chips swimming in extra vinegar with red pepper flakes on top. Yeah, it's that hot ... but sooo good. And don't forget our friends at Menujoy.com for the newest area menus.